If you have been following the Occupy Wall Street Movement, you may have already seen this clip last week. In case you missed it, here's the rundown. Jesse LaGreca, a vocal member of the Occupy Wall Street Movement, was interviewed by a producer for Greta van Susteren‘s Fox News show. The articulate LaGreca quickly puts the producer in his place, prompting him toward the end of the clip to admit: "Fair enough. You have voiced an important reason to criticize myself and my company." The New York Observer shared the video that Fox chose not to run. As the Observer writes, "... the decision was made to leave [this segment] on the cutting room floor. The reason should be obvious pretty quickly." This week, the state budget dominated with the introduction of the House Republican budget. We also weighed in on the cost of a voter ID law and the rules for CEO pay. 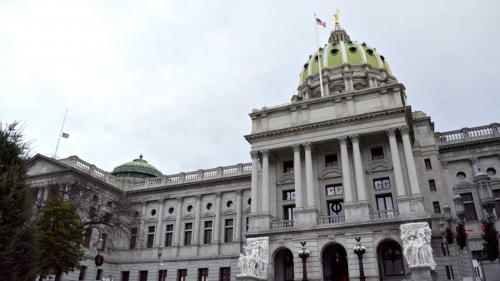 On the state budget, Chris Lilienthal shared a Patriot-News feature that asked the Pennsylvania Budget and Policy Center what a good budget would look like. Chris also wrote an initial take on the House Republican budget plan unveiled on Tuesday and later in the week highlighted the center's full analysis of that plan. Sharon Ward blogged about another recent Pennsylvania Budget and Policy Center report on what it would cost to implement a voter ID law in Pennsylvania. Finally, on income inequality, Mark Price wrote about a change in the rules of measuring CEO pay at Wal-Mart that ensures CEO compensation keeps growing. The Pennsylvania House of Representatives is considering legislation that would require every citizen to present photo identification as a condition for voting in primary and general elections. Many recently enacted voter ID laws have been subject to legal challenges, and states considering such laws are being proactive about including safeguards that eliminate impediments to a citizen's constitutional right to vote. But it doesn't come without cost. In a recent policy brief, the Pennsylvania Budget and Policy Center applied the experiences of other states with voter ID laws to estimate the cost of implementing such a law in the Commonwealth. In order to meet the requirements set forth in the legislation and avoid potential litigation, PBPC estimates the first-year costs for a voter identification program of approximately $11 million.